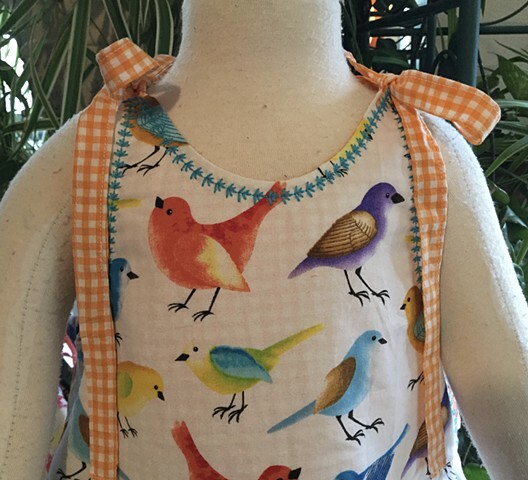 Vintage dishtowel overlays full skirted dress like an apron, made of new colorful birds print with orange gingham bodice lining, pockets and shoulder ties. Size Pre-School (3-4 years), measures 24” armhole to armhole, 21” shoulder to hem, pulls on over the head, ties in bows at shoulders and opens with two buttons on one side at the waist for more room. Decorative stitching like footprints of a bird defines top edge, $60, 100% cotton, made by the designer herself and shipped free to any address in the U.S.